There's no such thing as a perfect ground, but some grounds are better than others, depending on what you are studying. Learn about voltage, and the practical application of measuring a voltage differential. Consider how "incorrect" electrode placement can lead to "incorrect" experimental results. Review action potential mechanisms and the structure of neurons. Explain the concept of voltage, and what we really mean when we give a voltage value. Describe what types of recording results would be expected based upon ground electrode placement in different locations. Describe the method you would implement to find the best ground location for a given recording location. This lesson plan is designed to meet the Next Generation Science Standards and the Common Core Standards for Science and Technology. Click the grade level below to see which standards apply. MS-LS1-8 Gather and synthesize information that sensory receptors respond to stimuli by sending messages to the brain for immediate behavior or storage as memories. MS-ETSI-2 Evaluate competing design solutions using a systematic process to determine how well they meet the criteria and constraints of the problem. MS-ETSI-3 Analyze data from tests to determine similarities and differences among several design solutions to identify the best characteristics of each that can be combined into a new solution to better meet the criteria for success. MS-ETSI-4 Develop a model to generate data for iterative testing and modification of a proposed object, tool, or process such that an optimal design can be achieved. CCSS.ELA-Literacy.RST.6-8.6 Analyze the author's purpose in providing an explanation, describing a procedure, or discussing an experiment in a text. CCSS.ELA-Literacy.RST.6-8.9 Compare and contrast the information gained from experiments, simulations, video, or multimedia sources with that gained from reading a text on the same topic. CCSS.ELA-Literacy.RST.6-8.10 By the end of grade 8, read and comprehend science/technical texts in the grades 6-8 text complexity band independently and proficiently. HS-ETSI-3 Analyze data from tests to determine similarities and differences among several design solutions to identify the best characteristics of each that can be combined into a new solution to better meet the criteria for success. HS-ETSI-4 Develop a model to generate data for iterative testing and modification of a proposed object, tool, or process such that an optimal design can be achieved. CCSS.ELA-Literacy.RST.9-10.4 Determine the meaning of symbols, key terms, and other domain-specific words and phrases as they are used in a specific scientific or technical context relevant to grades 9-10 texts and topics. CCSS.ELA-Literacy.RST.9-10.45 Analyze the structure of the relationships among concepts in a text, including relationships among key terms (e.g., force, friction, reaction force, energy). CCSS.ELA-Literacy.RST.9-10.7 Translate quantitative or technical information expressed in words in a text into visual form (e.g., a table or chart) and translate information expressed visually or mathematically (e.g., in an equation) into words. CCSS.ELA-Literacy.RST.9-10.8 Assess the extent to which the reasoning and evidence in a text support the authorâ€™s claim or a recommendation for solving a scientific or technical problem. CCSS.ELA-Literacy.RST.9-10.9 Compare and contrast findings presented in a text to those from other sources (including their own experiments), noting when the findings support or contradict previous explanations or accounts. CCSS.ELA-Literacy.RST.9-10.10 By the end of grade 10, read and comprehend science/technical texts in the grades 9-10 text complexity band independently and proficiently. CCSS.ELA-Literacy.RST.11-12.3 Follow precisely a complex multistep procedure when carrying out experiments, taking measurements, or performing technical tasks; analyze the specific results based on explanations in the text. CCSS.ELA-Literacy.RST.11-12.4 Determine the meaning of symbols, key terms, and other domain-specific words and phrases as they are used in a specific scientific or technical context relevant to grades 11-12 texts and topics. CCSS.ELA-Literacy.RST.11-12.8 Evaluate the hypotheses, data, analysis, and conclusions in a science or technical text, verifying the data when possible and corroborating or challenging conclusions with other sources of information. CCSS.ELA-Literacy.RST.11-12.10 By the end of grade 12, read and comprehend science/technical texts in the grades 11-CCR text complexity band independently and proficiently. Begin by explaining that in this experience we have to first understand volts. Specifically, voltage is a measure of the electrical difference between two points. Ask students if they have ever combed their hair on a dry day and noticed their hair beginning to "float" towards the comb? This is because you have caused an electrical difference between your comb and your hair. Explain that when you comb your hair, the plastic comb "strips" electrons from your hair, making a difference in charge, or "voltage," between your hair and the comb. As a result, the separation in charge curiously makes your hair attracted to the comb, while also making individual hair strands repel each other . Explain that this difference in charge also means you can never just measure the voltage at a single point. Any voltage value that you see will always be a relative value, or, a value at one point (the comb) as defined with respect to the value at another point (your hair). 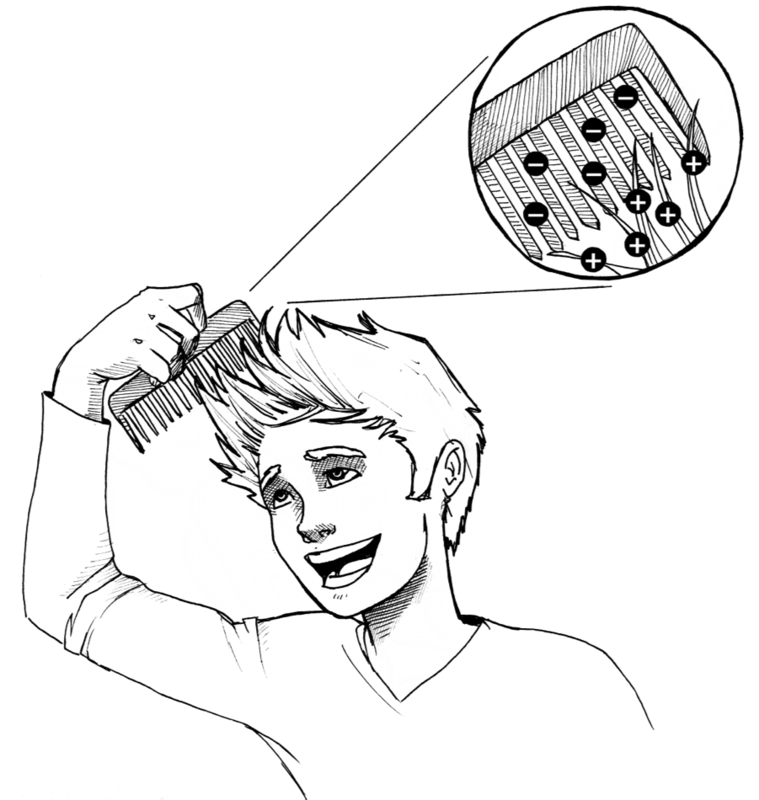 Your hair and comb have a relative difference in charge, with the comb slightly less negative than the hair. As another example, the nine volt battery which powers your SpikerBox has a 9V difference in voltage between the '+' and the '-' ends. Ask students to look at the SpikeBox electrode cable - how many needles does it have? Ask why they think the SpikeBox has two needles instead of one. If no students respond with this answer, explain that, in an ideal world, your two electrodes have distinct identities, a "recording" electrode that captures the signal of interest (spikes) and is hopefully near nerves, and a "ground" electrode that ideally is in a part of the organism that has little electrical signal present so that you can compare it with the spikes. Why? Because you need a difference between the two electrodes to see your spikes. Spikes (action potentials) are exceedingly small, on the order of microvolts to millivolts, and must thus be amplified by devices like your Spikerbox in order to be detected. Now ask students to consider a thought experiment where live in a strange, alternative world where action potentials travel infinitely fast down a nerve. Have them imagine we try to record spikes from this nerve with the same electrode configuration as above. If the action potential was infinitely fast, and we are measuring the voltage difference between the recording electrode and ground electrode, what would we expect to see? Have students record their predictions on their lab sheet. Summarize by reminding students that voltage measurement is a measurement of the difference between your recording and ground electrodes, you need to think carefully about where you place your electrodes when recording neural signals. In the top condition (electrodes far away, but both in neural tissue), you are recording a "very crowded" mix of spikes from six neurons (as you would see the three neurons near the ground electrode and the three neurons near the recording electrode). In the middle condition (ground electrode in bone, recording electrode in neural tissue), your recording would be less crowded as the ground electrode is in bone where no neurons are present. You would only see spikes from the three neurons near the recording electrode. Now consider the bottom condition. 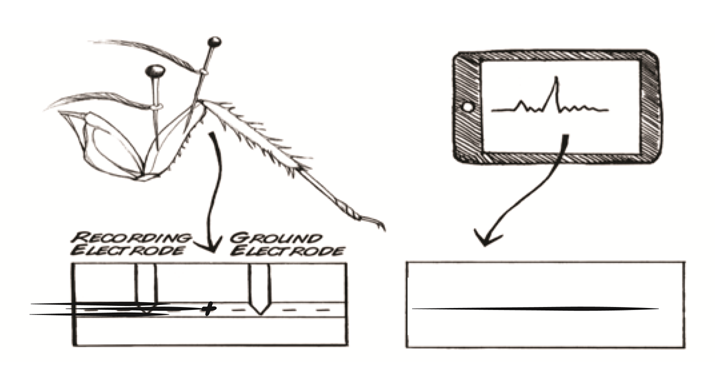 Notice there are two neurons exactly in between the recording and the ground electrode. Both electrodes would see the exact same signal from these two neurons; therefore you would not be able to observe the middle neurons. You would, however, be able to record from the neuron on the right side that is closer to the recording electrode. In this recording, you would get a very clean view from only 1 neuron, something neuroscientists love. Note: for this experiment we refer to "ground" and "recording" electrodes but you can arbitrarily decide which of your electrodes you will call a recording electrode and which one you will call a ground. 2a: Test the quality of your recordings in the femur with your ground in the coxa. Have students turn on and set up your computers/mobile devices for recording and prepare a cockroach leg as described in Experiment 1. Have students put one recording electrode in the femur, and the ground (reference) electrode in the coxa as shown below. Have students carefully touch the barbs on the leg with a toothpick. Is the response a "whoosh" or an individual spike train? When students blow on the leg, you should see a whoosh of neural activity with a lot of noise. The student drawings should reflect this. 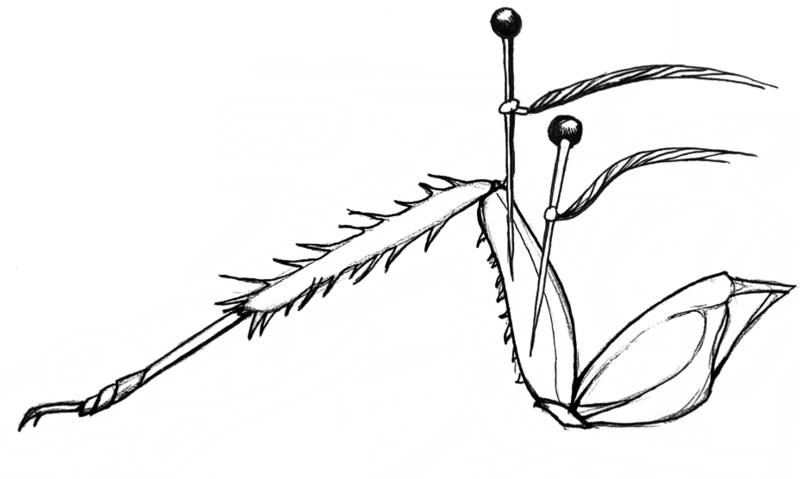 Carefully touch the barbs on the leg with a toothpick. Is the response a "whoosh" or an individual spike train? 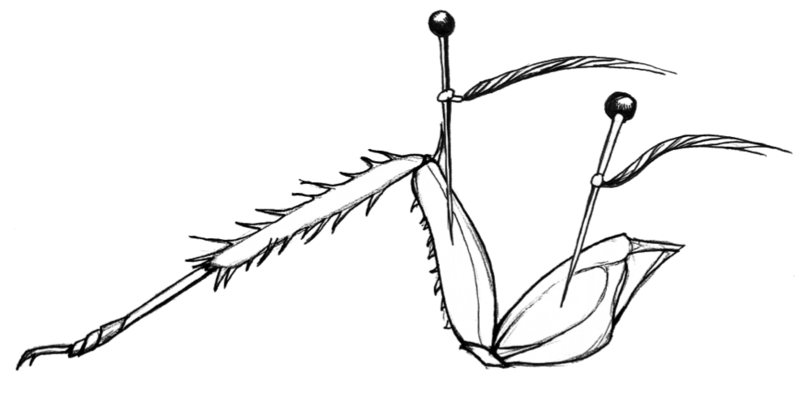 Touching the leg barb with a toothpick should produce a single spike. Graphs should show this difference. 2b: Now test the quality of recordings in the femur with both of your electrodes in the femur. When students blow on the leg, you should see a whoosh of neural activity with less noise than the first configuration. The student drawings should reflect this. Touching the leg barb with a toothpick should produce a single spike, and this spike should be cleaner than the first configuration. Graphs should show this difference. 2c: Now test the quality of recordings in the coxa with both of your electrodes in the coxa. What is voltage? Can you measure voltage at only one point? Why or why not? Voltage is the difference in charge between two points. You cannot measure voltage at a single point because you do not have anything to compare a single point to. Which configurations of electrodes provided the most "noisy" recordings (that included many overlapping spikes). Which configurations provided the â€œcleanestâ€ recordings (clearly visible individual spikes? Can you provide an explanation for the differences you observed? The first configuration (one electrode in the femur and one in the coxa gives the most noisy readings. 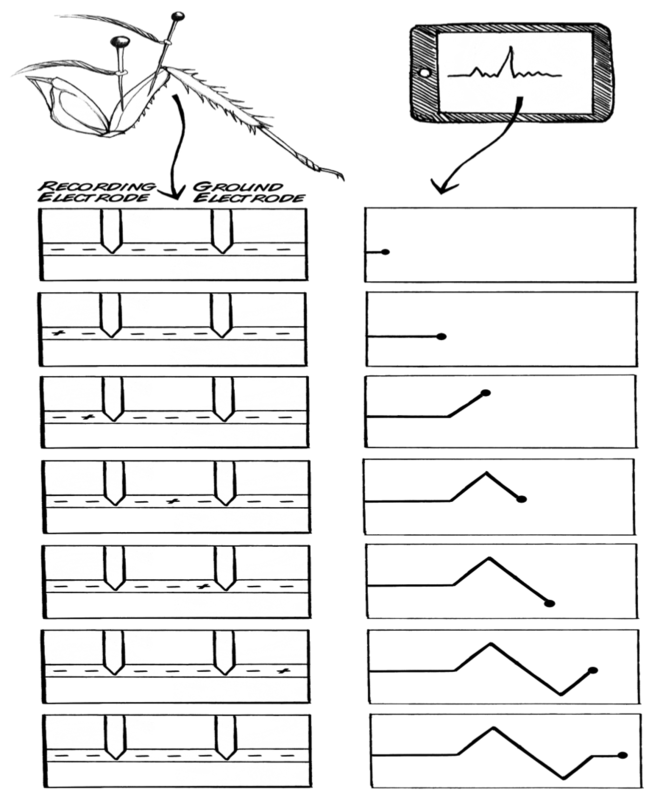 The second two configurations give the cleanest readings because there are fewer neurons between the two electrodes. With the electrodes spread far apart the two electrodes are registering activity in many different nerves. 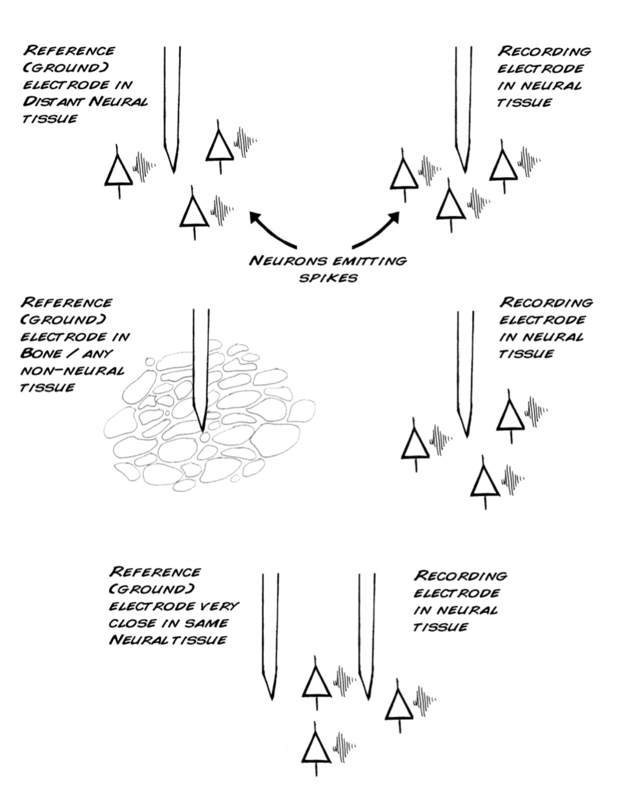 When electrodes are close together they pick up the activity of only a few neurons. In this experiment, you learned about what happens when you move your ground and recording electrodes to a new location. What do you think would happen if you reversed your 'ground' and 'recording' electrodes in the first configuration, moving the 'ground' to the femur and the recording electrode to the coxa? Would you observe any difference in the clarity of the recording? Why or why not? If you reversed the ground and recording electrodes in the first configuration, you would not see much difference in the recording. Voltage is measured as the difference between two electrodes, but it does not matter which is the recording and the ground. Imagine that you're a cockroach veterinarian, and you need to measure neural activity in a sick cockroach with a weak femur. Describe the method that you would implement to find the best ground location for measuring neural activity in the femur? How will you know that your recordings are good? To measure the voltage in the femur nerves of a sick cockroach, you would want to place both electrodes in the femur and place them as close together as possible. You could improve the grounding, by moving the electrodes around and trying to determine whether additional placements improve the recording.